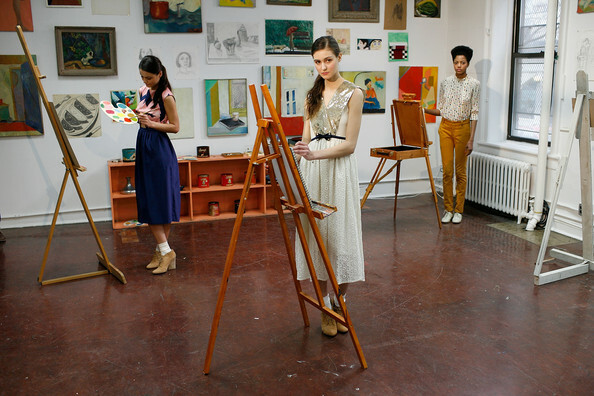 Of all the spectacular NYFW Fall 2012 showings, one in particular I was extremely charmed by was American designer Lauren Moffatt's RTW collection which took the concept of going back to school quite literally. The presentation staged at the Old School which used to house St. Patrick's Cathedral School had models set up in two classrooms, one a traditional style with desks and a makeshift chem lab in the corner and the other an art class with easels. The venue couldn't be a more appropriate backdrop for this lovely school girl inspired collection. I'm a fan of the modest midi lengths and have always adored the unabashed prettiness of her chic trademark prints. The vintage styling of these silhouettes with details like Peter Pan collars, sequins and playful cut-outs just feel so sweetly feminine and wearable to me. I'm ready to go back to school this fall... See the full collection here. There's still time to enter my Harvey Prince fragrance giveaway! Such a sweet collection! Love all the little details too. Lovely snaps - love the gold dress. I love all the pictures! And the dresses too! oh! These are almost to cute to be true, love the concept! A conceptual collation doesn't always work when it comes to make things come true, but this one worked wonderfully! This is a really great photo shoot, I love when people do something a bit different. There are definitely a few of these pieces I would wear. those are great collections! love the colors!!! i love those yellow prints! I love the concept of the school setting. i love this... it looks so sweet and has such a great retro feeling. loving all of the refreshing patterns. What a fun presentation and of course fun clothing! Not only is the collection charming and lovely but I love the backdrop that they chose to showcase it. Goes perfectly. I love this super girly collection and the prints are so much fun too! The blackboard backdrop is pretty cool too! Me likey! but the patterns and colors are so sweet and lovely. Oh, this collection is just too cute for words. How chic and adorable! I love all the designs and couldn't agree with you more in regards to the backdrop. I feel like carrying a book bag! Ok, maybe not (my science books were soooooo heavy). hahaha Rowena, this is great! I've fallen in love with it too. Girl, thank you so much for your comments on my post. I LOVE YOU!!! You are such a doll! I push for 5 topics a week, but when I started my new blog this year I said 4 would be ok. HAHAHA But I always feel my readers want more, so I try and go that extra mile. It's work, can be frustrating at times, but definitely rewarding. I think about you and some others that truly keep me going. In the mornings, I'm like what is Rowena posting about today? HAHAHA Thanks for being a good friend. ((HUG)) Have a great day! I like the school classroom backdrop! I am not very well versed in Lauren Moffatt but her designs are absolutely amazing! I like the yellow and navy patterned dress! Such a cute way to present the clothes. I love the feel of them although there's not many pieces that I think would be flattering on me. Cute! The second outfit is my favorite, I like the modest cuts as well. Such a cute collection. She certainly uses beautiful prints. I remember seeing this amazing collection and thinking "I want every piece!" It's all so cute and whimsy and loved the whole school girl approach. great pictures! such a fun lookbook!!! lots of colors! cant wait for spring-summer! I adore the style and colors...great collection!! I'll take all of them, please. Wow! Extremely unique and creative! Love the collection! 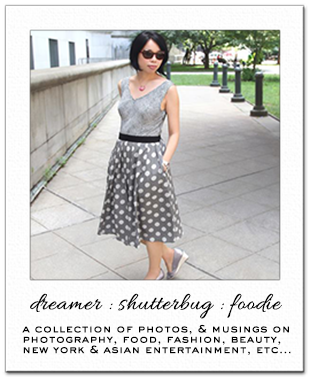 I passed the Versatile Blogger award to you! Congrats! Cute collection. Love the background and theme. Very creative and unique. so cute + utterly creative this is!! love!! loving the print and the sleek and chic design in each of these. lovely! also love the collection, demure hemline, lovely print, perfect! Too cute! 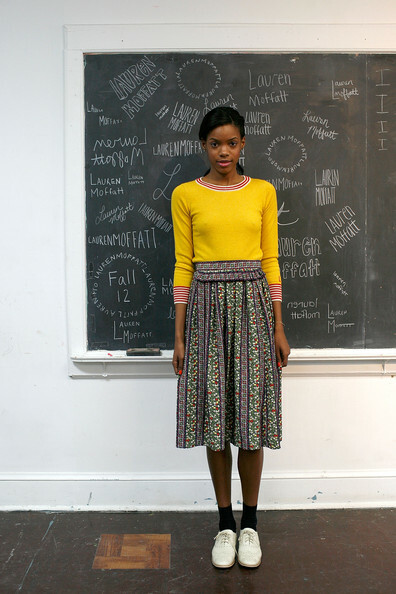 Her clothes are gorgeous (and new to me, so thanks for the introduction) and I love that she staged it in a classroom. I love this, the clothing is very vintage and pretty and that set is so charming! omygoodness. this presentation completely slipped from my radar. Can I take one of everything please? It's a very nice collection and it's a very original and great presentation. Such a sweet and lovely collection. I'd never heard of Lauren Moffatt before but I like the outfits you posted. :) These are adorable. more lauren moffatt goodness found here--i found this collection video on their website. enjoy!